The call comes once or twice a month. On one end, a woman fleeing her abusive husband, on the other, a social worker or lawyer or police officer trying to help. Sometimes it is an intake interview, facilitating the woman’s entry into a shelter for abused women. Other times, it is pre-trial prep for a divorce or child custody hearing. The most terrifying calls come from 911. Interpreting for such desperate conversations inspired me to write The Mango Bride. 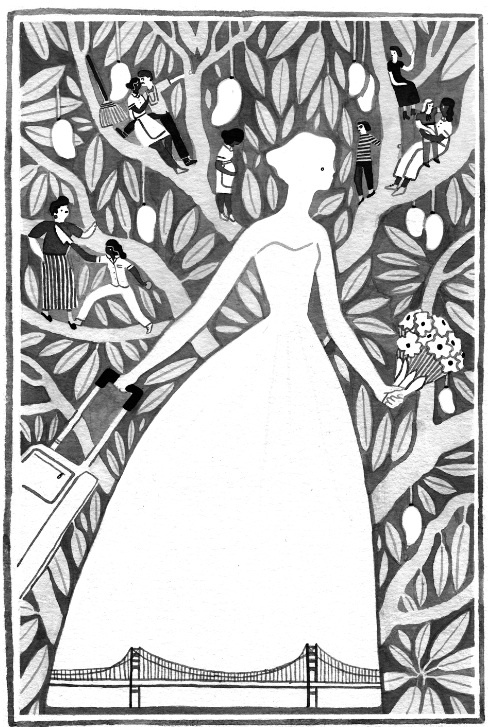 Beverly, the immigrant wife whose dreams of a better life vanish when her marriage turns violent, is a composite of all those anonymous women for whom I translated. I have never met any of the callers in person, yet I know them all too well. Theirs is the story of a high school classmate, of a favorite aunt, of the women who read my novel and told me that they or someone they knew had suffered just like Beverly. After several women had come to me with their own stories of domestic violence, I realized that more could be done – should be done – to spare others from suffering Beverly’s fate. A search of local nonprofits led me to Access, Inc., http://vawahealthaccess.com/ a community based organization that helps victims of domestic violence. Anne Bautista, the immigration lawyer and VAWA (Violence Against Women Act) Program Legal Director at Access, screens 120 domestic violence victims every year. From that first group she takes on 36 new clients, gathering evidence, representing them at INS hearings and helping each woman gain access to other services, such as counseling or prenatal care. Domestic violence cuts through all socio-economic classes. Anne pointed out that 80% of the women who seek her help speak only Spanish, live below poverty level and are undocumented. The Filipinas who comprise the remaining 20% of her clients are mostly bilingual and highly educated doctors, lawyers or accountants. Despite their widely different backgrounds all immigrant wives become vulnerable when their legal status is controlled by an abusive spouse. Perhaps things might have turned out differently for Beverly If I’d learned about Access while writing The Mango Bride. It’s too late to change my novel’s ending, but here is your chance to help rewrite the destinies of real life women like my tragic protagonist. 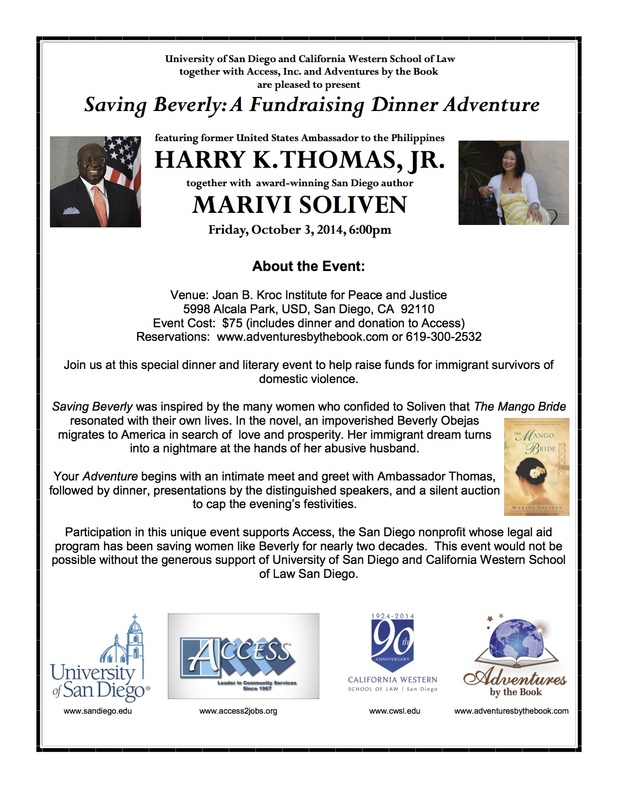 Saving Beverly is a fundraising dinner which I conceived with the help of Susan McBeth, founder of Adventures by the Book. The Honorable Harry K. Thomas Jr., former U.S. Ambassador to the Philippines has kindly agreed to speak at the October 2 event. During his tours of duty in Bangladesh and Manila, Ambassador Thomas took a special interest in advancing the rights of women and girls. He read The Mango Bride, enjoyed it and generously accepted our invitation to visit San Diego from Tempe, where he currently teaches as diplomat in residence at Arizona State University. It is our great good fortune that Ambassador Thomas and his lovely bride Mithi Aquino-Thomas are lending their support to this cause. We hope that you will, too. If you know someone who has suffered domestic violence or if you simply want to ensure that Anne can continue helping immigrant wives reclaim their lives, please join us on Thursday, October 2. What a beautiful way to blend activism with literature, Marivi. I’m sorry I won’t be in town for this event, otherwise I’d certainly join you.